Posted on May 13, 2013 by Susan H.
The muffin for today’s Allergy Friendly Muffin Monday was chosen especially for my Mother’s Day breakfast. 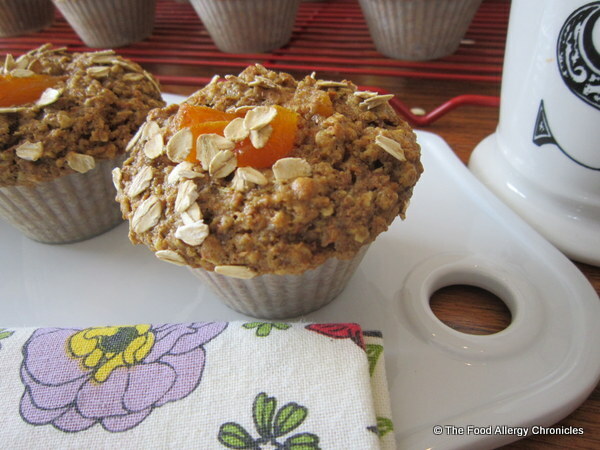 Full of oats, bran and plump apricots…perfect with a cup of tea! I have been holding on to this recipe for awhile…waiting for the perfect time to give them a try…Mother’s Day breakfast was ideal. This recipe is from the June 2002 issue of Canadian Living Magazine. Click here for the original recipe. 1) I replaced the buttermilk with 1 cup of Natur-a Rice Beverage or Natur-a Soy Beverage mixed with 1 tbsp. white vinegar left to set while I measured the rest of my ingredients. 2) I replaced the egg with a flax egg…1 tbsp. of flax meal mixed with 3 tbsp. water and left in the refrigerator over night or until it thickens. Update: 3) I added 1 tsp pure vanilla to the wet ingredients. 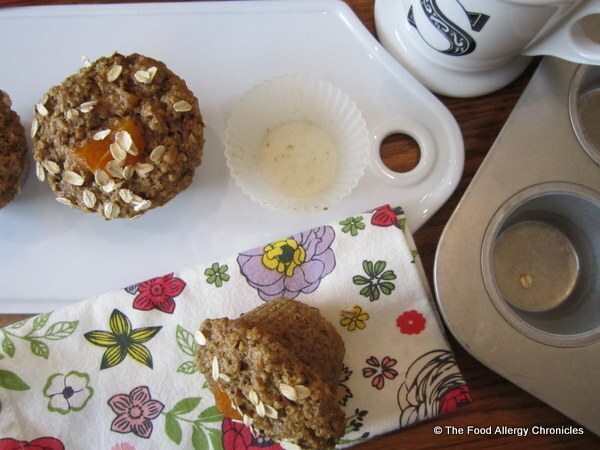 Thanks to a reminder from Candace…I baked the Dairy, Egg, Soy and Peanut/Tree Nut Free Apricot Oatmeal Muffins in my silicone muffin cups instead of paper. The muffins popped out perfectly. I think next time…a touch of ginger would be a nice addition. In the meantime, a drizzle of local honey was the finishing touch. 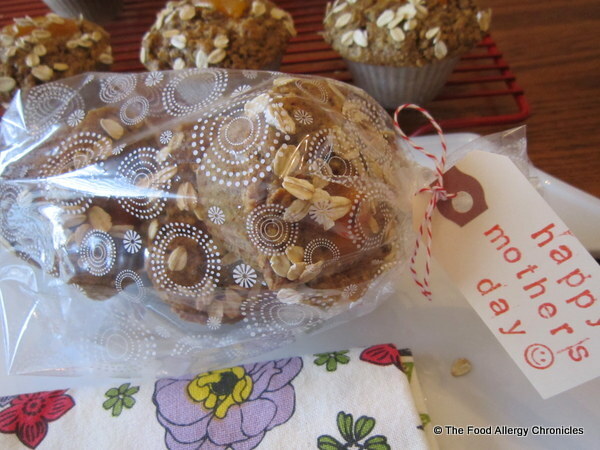 I packaged up a few Dairy, Egg, Soy and Peanut/Tree Nut Free Apricot Oatmeal Muffins for my mother-in-law for Mother’s Day…she was quite pleased. Don’t worry mom…I have popped a few in the freezer for your next visit. 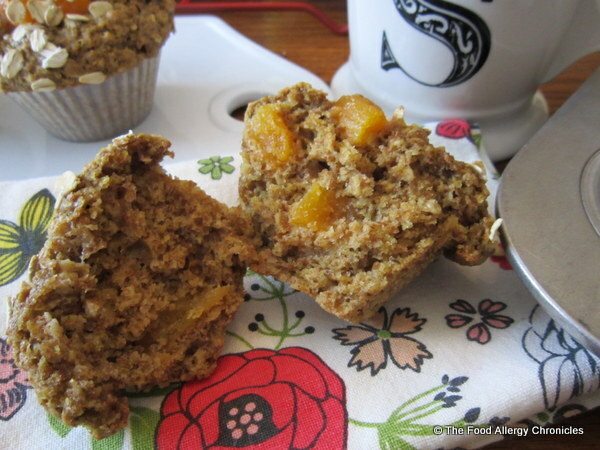 This entry was posted in allergies, baking, dairy free, egg free, muffins, multiple food allergies, oats, peanut/tree nut free, Snacks, soy free and tagged Canadian Living magazine, Dairy Egg Soy and Peanut/Tree Nut Free Apricot Oatmeal Muffins, Natur-a Rice Beverage, Natur-a Soy Beverage by Susan H.. Bookmark the permalink.